Ajit Gulabchand is not fond of the arclights, but he shed his reluctance for once - just like a proud father would do in the company of his famous child. 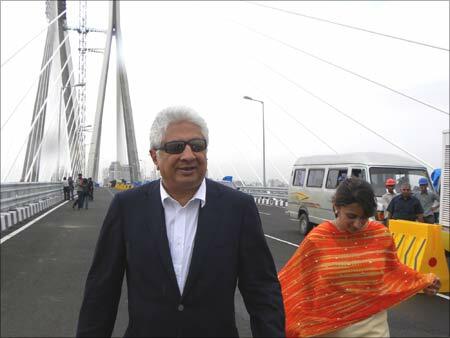 So Gulabchand was happily posing for the cameras in blue jeans and black blazer, but only after making sure that the photographers had the two central towers of the Bandra-Worli Sea Link in focus. 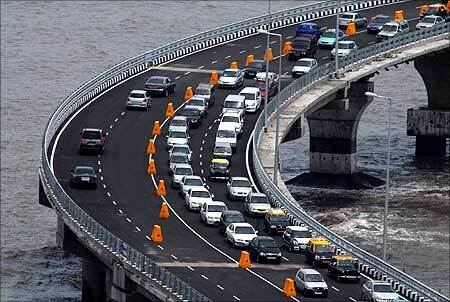 The occasion was a press conference to explain the contours of the spectacular project a day before Congress President Sonia Gandhi formally opened Rajiv Gandhi Setu, to give the link its official name, to the public. Gulabchand's rare exuberance was understandable; Hindustan Construction Company (HCC), of which he is the chairman and managing director, has never done anything like this before. So he was busy telling anybody who had the time to look away from the breathtaking sight of the Arabian Sea below that the pylons of the cable-stayed bridge are 126 meters high, equivalent to a 43-storey building; it has 37,680 km of wire, nearly the circumference of the earth; and weighs 670,000 tonnes, about as much as 50,000 African elephants. It was almost like a doting father reading out the formidable CV of his accomplished child. For a change, he was not willing to talk about the protracted dispute between the Maharashtra State Road Transport Corporation and HCC over the cost escalations owing to repeated design changes. Clearly, the 61-year old businessman didn't want anything to take away the spotlight from his crowning glory - the 5.6 km bridge that has changed Mumbai's skyline forever. Although the bridge has made its contractor a household name, HCC has several other spectacular achievements under its belt. For one, it has already made it to the Guinness Book of Records for its work on the world's longest barrage - the Farakka Barrage in West Bengal. It has also constructed more than a quarter of India's hydro power projects, including some of its more eye-catching and technologically challenging dams; over half of the country's nuclear power generation capacities; and over 2,200 km of roads and expressways. Even more ambitious than the sea link is HCC's project to set up India's largest Hill City, Lavasa, not too far from Pune. Lavasa is spread across 12,500 acres over seven hills and enjoys a spectacular, 60-km lake front. If Gulabchand manages to pull off the multi-faceted project, with plans for colleges, hospitals, hotels and conference centres (shades of Davos, where Gulabchand is a regular along with partner Tavleen Singh), it will catapult HCC into the major league. Not bad going for a man who lost his father when he was 18 and was asked by his brother (26 years older than him) to help out in the Walchand Hirachand family's rather formidable business during his college vacations. Gulabchand is, however, not your typical workaholic. This Sydenham College graduate is known to make the time to live life kingsize: One of his favourite getaways is his Balinese style beachfront home in Alibaug, a short boat ride from Mumbai. He enjoys skiing; at the Davos meets, he can disappear for the day to the slopes above the conference venue. He has many political friends, chief among them being Sharad Pawar (who was an initial partner in the Lavasa project), and strong political views (favouring the BJP). He has recently endowed an "Ajit Gulabchand Chair" on Indian Business Studies at Oxford University, and is a signatory member of the United Nations Global Compact's CEO Water Mandate. Gulabchand is also a man in a hurry. He is impatient with India's governance and decision-making processes, which he thinks hold back the country as well as his company. He was impatient with his cousins, too, for their lack of drive while running the undivided Walchand Hirachand group's business. He pushed for a free hand, and when the prolonged, eight-year family settlement process was on, he opted for HCC which had few takers. He has also gone on record to say that while all his shares in HCC would go to his only child, Shalaka, the company would be run by professionals. That, however, is something in the distant future. Gulabchand is still fighting fit - a result of his daily jogging on Marine Drive, for over 30 years. For now, the father and daughter duo are busy enjoying their place in the sun on Mumbai's latest landmark. 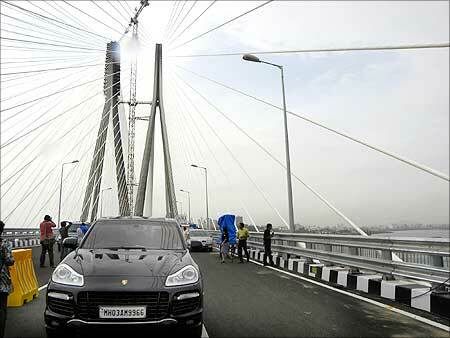 Sea link: Traffic jam on Day One!